Dabke is a popular Arab folk dance throughout the Levantine region (Lebanon, Syria, Palestine, Jordan and Iraq). The dance is done at weddings and other joyous occasions. 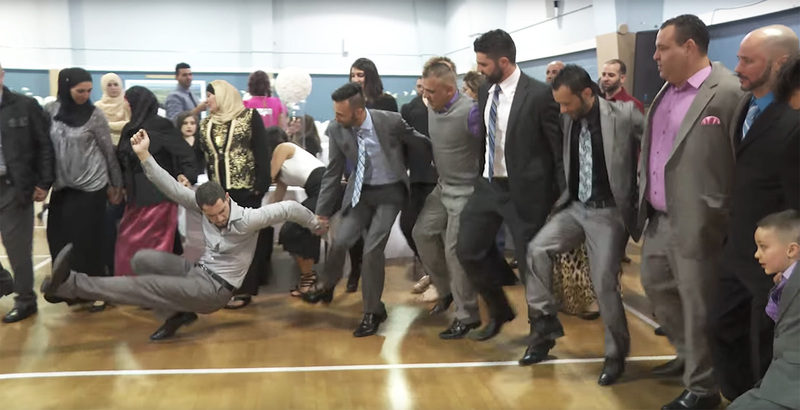 While there are many variations of dabke, it generally involves a long chain of dancers who perform a range of synchronized steps, stomps, jumps, and kicks. The leader of the dabke heads the line, alternating between facing the audience and the other dancers. Did the stunning performances in the video above make you wanna dance and are you looking for some good Dabke music? Check out the 5 Dabke songs below and start moving those hips! Don’t know how to dance Dabke? Is it your dream to be a confident Dabke dancer stealing the show at weddings and parties? Are you ready to let loose and really enjoy yourself? Are you ready to learn Dabke that connects you with your culture, your friends and your family? If so, let Samir Hasan help you! He is an experienced Dabke dancer who trained dozens of people to do Dabke and performed in hundreds of shows. This has given him a rare insight into how to perform and teach Dabke moves from many countries including Palestine, Iraq, Lebanon, Jordan and the Gulf. START LEARNING HOW TO DANCE DABKE NOW!